Marinated, Grilled Chicken Thighs, Thyme for Cooking easy summer recipes. We marinated the thighs while the grill heated, then made a basting sauce with the marinade. Leave the skin on for cooking, remove or not before eating. 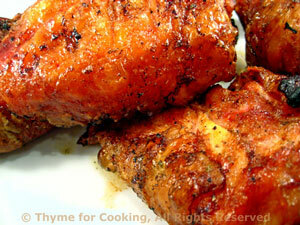 Mix all ingredients for marinade, spoon over thighs and let marinate for 10 - 15 minutes. When ready to cook, remove thighs and reserve marinade. Heat reserved marinade in a small saucepan. Add ketchup, soy sauce, cumin, paprika and bring to a boil. Start basting the thighs after 10 minutes and baste 2 - 3 times. They'll be done when they are nicely browned and the juices run clear when pierced with a knife.